Our little 'garden' (alias numerous terracota pots just outside the back door) is doing well. We've picked our first strawberries, are keeping an eye on the growing tomatoes, and hope to harvest some baby beetroots soon. But most successful has been the zucchini container (or 'courgette container', as it would be known in the UK). I've got three yellow zucchini plants in one large container, and they obviously seem to thrive there. I've already harvested one good-sized zucchini (click here or see the photo on the right), and we've been eating quite a lot of zucchini blossoms. 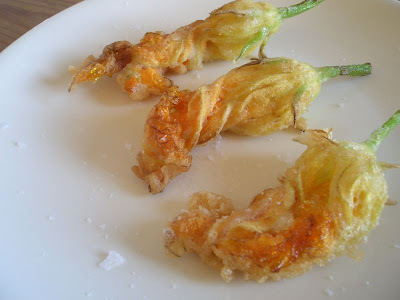 Whereas I've always known that young zucchinis are wonderful, then zucchini blossoms have been a new discovery for me. And what a delightful discovery they've been - they've got a delicate zucchini flavour, beautiful shape and unusual texture. We've only harvested male blossoms, as we want to harvest as many zucchinis as possible from our 'garden'. I made sure that all my zucchini blossoms were clean and dry, then dipped them into a batter made of approximately 1 part plain flour and 1 part water (aiming for the consistency of not-too-thick sour cream). After dipping them in batter, I deep-fried the zucchini blossoms in olive oil that I had heated in a small sauce-pan (about 1 inch/2-3 cm of oil), turning them once. Once the zucchini blossoms were golden brown, I drained them on kitchen paper, sprinkled with some Maldon sea salt flakes, and enjoyed them straight away. Again, make sure your zucchini blossoms are clean. 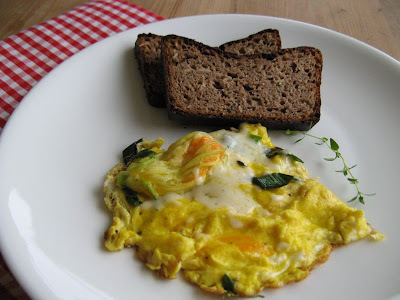 Whisk some eggs (say, 2 per person) in a small bowl, add a dash of water, whisk again and season with salt and pepper. Heat some olive oil in a non-stick frying pan over medium heat, add zucchini blossoms and fry gently for about 30 seconds. Pour over the egg mixture, reduce heat to low, and let it set for about 30 seconds to 1 minute. Stir couple of times, sprinkle some chopped green onions and spring onions/scallions on top, top with a spoonful or two of grated soft cheese (mozzarella, feta, soft goat cheese or Cheddar - all would work). Cover the frying pan with a lid and let the frittata set over a low heat. Alternatively, give it a few minutes under a hot grill. WHB: This is also my entry to the Weekend Herb Blogging, this time hosted by Susan of Food Blogga. You can read Susan's roundup here. The blossoms really are a treat, I agree. Unfortunately so do the butterflies in my garden. It's a race to see who gets them first! 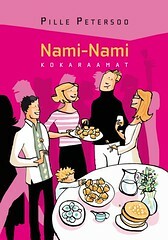 Need friteeritud õied näevad nii kenad välja. Mina ei ole kõrvitsaõitega peale täitmise eriti midagi ette võtnud, aga täidetult ja küpsetatult on nad tõesti maitsvad ja "söö või silmadega" omandab uue tähenduse :P, sööjate imestusest rääkimata. PS! Suuured tänud pakikese eest! Kohale jõudis seekord täitsa ühes pakis ja sisu on nii mõnus. Your zucchini blossom recipes make me want to go out and buy some right away. I have made the fritters but have not made the frittata, but I must because it looks so simple. Your blog is fantastic. Keep up the beautiful and inspired work! Looks very yummy. I must try cooking them myself. I do love your yellow zucchini too. I have some squash that's called crookneck here which looks a bit like yellow zucchini, but they taste very different. Oh that looks yummy. We only very rarely find zucchini blossoms here. But whenever I do I am sure to make this one. It's such a wonderful feeling to be able to grow even a fraction of your own food. I love the thought of your container vegetable patch! The blossoms looks gorgeous. I've got something going up about them soon - stuffed but no batter. Gorgeous post! I've never had zucchini blossoms, but fried and in an omlette sounds delish! Growing up, my mom always dipped them in batter and fried them. It was a once-a-year a treat that the whole family anticipated. I still make them that way, but I also love them in fritattas, sauteed with baby veggies and served over pasta or polenta, or stuffed with ricotta cheese for an appetizer. They are jewels, aren't they? A garden full? I'd be estactic! Thanks for the great entry, Pille. I've had the fritters, but the omelet is a wonderful idea! I've set aside a recipe for zucchini blossoms stuffed with ricotta, that's on the menu for this weekend. Usually I just make them as you did, dipped in batter and pan fried. It will be fun to stuff them! This is one of those things I still find so exotic because I've never had zuchini blossoms. But now after all these pictures and descriptions, I wish I could try it soon. It is such a pleasure to read yor blog! I found it about a month ago, and it is one of the first things I read when I go on line each day. Thank you for sharing part of your world, it is lovely. Early this morning, I went out to get the newspaper and I walked past my pattypan squash plants. (I live in the suburbs and I plant mine among the flowers in the front yard flowerbed.) There were five new male blooms. I thought to myself, " Pille cooked these. I am going to give it a try, too!" So today I had a very funny and yummy breakfast of fried squash blossoms while I read the news. I'll do that again! Surely fried sqaush blossoms are better for me than a donut! Next, I will make your frittata. Thank you for the inspiration. 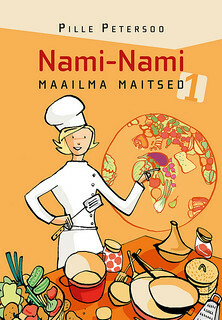 I am certain that I will try many of your featured recipies in the days to come. I am a teacher. I have had the good fortune of teaching teenagers whose have come from all over the world. They are surprized that I don't cook the way that they think most Americans do... by opening boxes and cans of pre-mixed or ready to prepare food. One time, I was discussing food from Lebanon with one girl and Indian food with another. It was such a pleasure to be able to share the commonality of food well made with these young ladies. We discussed their foods and the methods of preparation. Suddenly, both girls turned to me. "Ms. Wise! How do you know so much about our foods?!" I gestured to my plump self and replied;"I speak food in any language." It is true. Thank you, Pille, for helping me learn even more "languages"! Oh, these look too beautiful! I realyl meant to grow zucchini this year but the time when I shodul have been planting I was travelling and the weather just sucked, so I guess I will have to wait for next year. One of the nicest dishes I have ever had in a restaurant was zucchini blossoms stuffed with goats cheese, deep fried in a light batter and drizzled with honey. Incredible. Thredahlia - mul seisab veel nende kõrvitsaõite täitmine ees. Rõõm kuulda, et pakike kohale jõudis - ma sain Su kaardi ka kätte juba! Passionate Palate - thanks for your sweet comment! And do try the frittata, too, especially if you've got some good organic & free-range eggs. Kalyn - I need to look out for that crookneck squash - that sounds cool! Karin - oi, need Napoli basiiliku-ricotta täidisega frititud suvikõvitsaõied kõlavad maitsvalt. Kas oled nüüd juba ise ka teha proovinud? Sophie - oh no, they weren't chewy at all, so no need to be afraid of that!! Meeta - I would have thought you've got pretty good fruit & vegetable markets around (judging from your cooking!) - hope you'll see those blossoms again soon! Figs olives wine - it is satisfying to grow our own stuff. And the container thing is definitely temporary. We've got a pretty large garden, over 2000 m2, which is just a field at the moment. I hope to have quite a few beds for my vegetables next year, as well as plant some fruit trees. k&s - hope you'll get a chance to eat some zucchini blossoms soon! Susan - I can't believe I'm replicating your mum's simple recipe - that's so exciting! And thank you for hosting the WHB! Katie - that sounds so weird, considering how much further south you are! Hope you'll get to harvest plenty of zucchini flowers soon!! Lydia - I must try them stuffed, too. Luckily, there are still plenty of blossoms out there..
Christine - I'm keeping my fingers crossed for you! Jeanne - next year will come soon :) I'll be much smarter next year, too. First of all, I won't put more than one plant per container - they need a lot of compost, and don't like crowded conditions. And in any case I hope to be able to plant my vegetables in a proper (i.e. non-container garden) next year. That dish of goat cheese-stuffed zucchini blossoms with honey sounds divine!